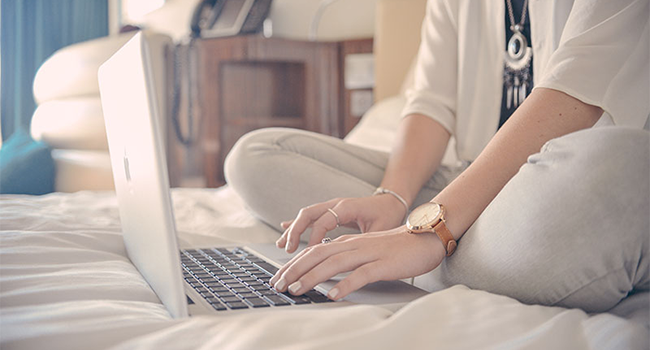 Since hoteliers get the majority of their bookings through online channels, online reputation management is super important (check out our course to learn more). A whopping 148.3 million travel bookings are made online each year, and 4 out of 5 travelers start their travel planning online too. Those travelers are coming across countless user reviews about your hotel through search engine results, review sites, social media pages and OTA listings. Did you know a hotel has an average of 238 reviews? 62% of TripAdvisor users have said that seeing management responses on reviews makes them more likely to book. Due to the fact that potential guests place so much importance on reviews, a negative one can effectively destroy your hotel's reputation. As a result, hotels have threatened, charged and sued travelers for leaving bad reviews. Not the best solution, because all of those resulted in more negative exposure. Some hotels struggle to come up with a suitable response to negative reviews, but it's really not that hard once you know the tricks (our lesson on positive reviews can help). Though it can be incredibly frustrating to get an unreasonable, negative review, you're going to have to deal with it. 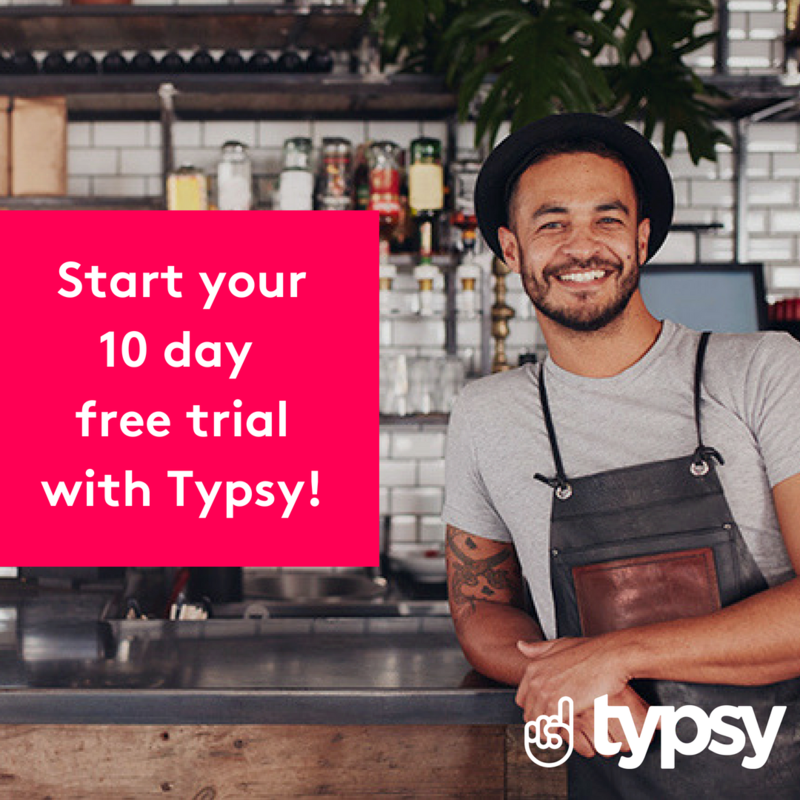 It's out there, and by responding you're showing readers that you care about resolving problems with your guests. The first step for responding to a negative review should be to take a step back. In no case should your response be defensive! It may backfire horribly if you do, like it did for the owners of Amy's Baking Company in Arizona, who decided to post defensive statements on Facebook. The internet responded hilariously. A good way to open your response is by thanking the guest for their feedback and apologizing for their negative experience. From there, you can offer any steps you need to take to resolve the problem. You want to write personalized responses to each review (and not just the negative ones!). When possible, look to offer a solution to the problem, but take those conversation into a private space. Contact them directly if you can, or ask them to email you. Sign off with your name and your position at the hotel. It's best if the hotel manager deals with review responses personally if possible. Now let's dive into some specific responses you can write. Most hotel customer service complaints revolve around the check-in or check-out process. As a hotel owner, you want to reassure the guest that you're looking into the matter and speaking to your staff about it to make sure it doesn't happen again. Hi Alex, thank you for your feedback. I was disappointed to read that you did not have a pleasant check-in experience and can assure you I will be personally investigating the matter. I know our front office team will do everything in their power to check our guests in as soon as possible however, on the occasion our guests arrive earlier than 2PM, it may require a few phone calls to our housekeeping team to clean the room. This manager even offered a careful explanation for the guest's check-in delay, showing other readers this reviewer may have been partially at fault here, all while keeping a respectful tone. Hey Susan, thanks for taking the time to give your feedback. I'm sorry to hear the rooms weren't up to the standard you've come to expect from us. I have personally addressed this with our housekeeping staff to ensure this won't happen again. Please contact me through john@starfishhotel.com if you want to discuss this further. Reassure the guest – and potential other guests – that cleanliness is something you take very seriously (as you should) and that you are taking extra measures to get it right. Hey Adrienne, thanks for your review. I'm sorry to hear you had a bad night's sleep because of the noise from the club downstairs. I wish you would have addressed this with us as we do offer free earplugs at the front desk which could have helped. Hope your stay in Sao Paolo was otherwise enjoyable and hope to see you back some day. It would be great if you could offer a backup solution to noise, like earplugs, if this is a frequent complaint. Let guests know about it to prevent negative reviews, and bring it up when those reviews do come up to let people know you're doing everything to help and make them comfortable. Mistakes happen, be it a mess-up at the front desk, a third-party booking provider, or simply a miscommunication with the guest. If you haven't resolved the problem yet, you really need to get in touch with the guest directly. After that, you may write a response to let the outside world know it has been resolved. Hey Barry, thank you for your feedback. I'm sorry you have been charged for an extra night. As we spoke about on the phone, we have refunded you the extra paid amount which should be showing up on your online banking within 2-3 business days. I apologize again for the inconvenience. Sometimes stuff breaks down. Sometimes guests expect 5-star rooms on a backpackers' budget. In either case, they might go online to complain about your facilities. Hey Simone, thank you for taking the time to share your review with us. We appreciate your valuable feedback as it helps us identify the areas we can improve the guest experience. I was disappointed to learn of the shortcomings you experienced and we're currently taking steps to upgrade some of the bathroom facilities. I hope these examples will get you started with replying to bad reviews. I wanted to share one last tip with you, and it's about monitoring reviews. TripAdvisor and Yelp both have an email service to notify you about new reviews, but how do you keep track of people talking about you in other online spaces? 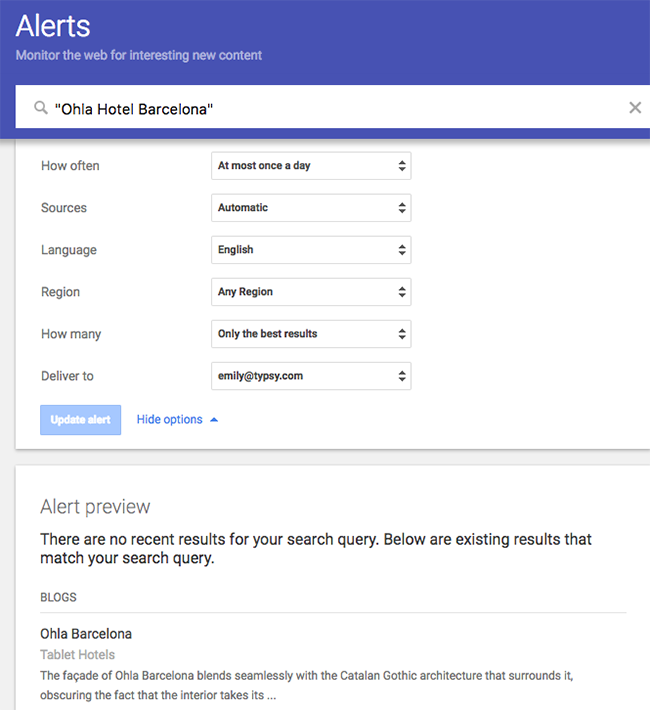 Google will then send an alert to your email address every time your keyword is mentioned anywhere on the web. It's pretty handy, because then you can reply in a timely manner. Too easy! 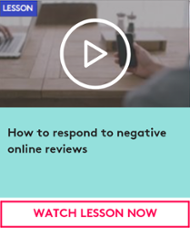 Learn more about responding to negative reviews and take our lesson now with reputation management expert, Joshua Swanson.